The murals with the city are still on hold or in the works. So stay tuned! And in terms of street based stuff, I have hardly got anything up around town for ages…so that must be a new years resolution. 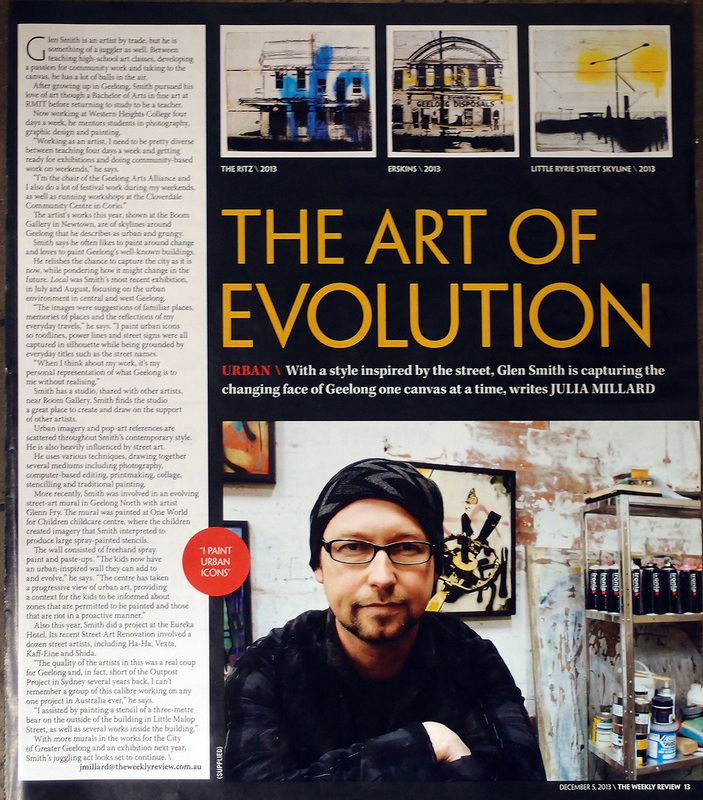 The article in the weekly review came out in early December with my profile in it…and as a positive note from this article, I sold two large works in week one of the gallery reopening this year with a buyer who had seen my work in the magazine in December and wanted to see more. So that was an awesome start to the year and will go towards framing a bunch of other artworks. 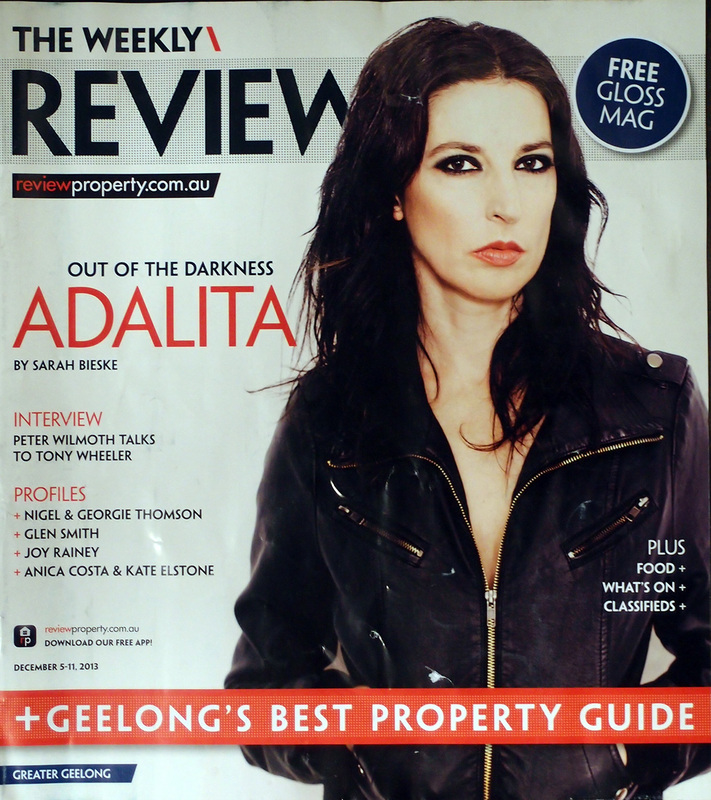 So thank you to Julia and the Weekly Review! 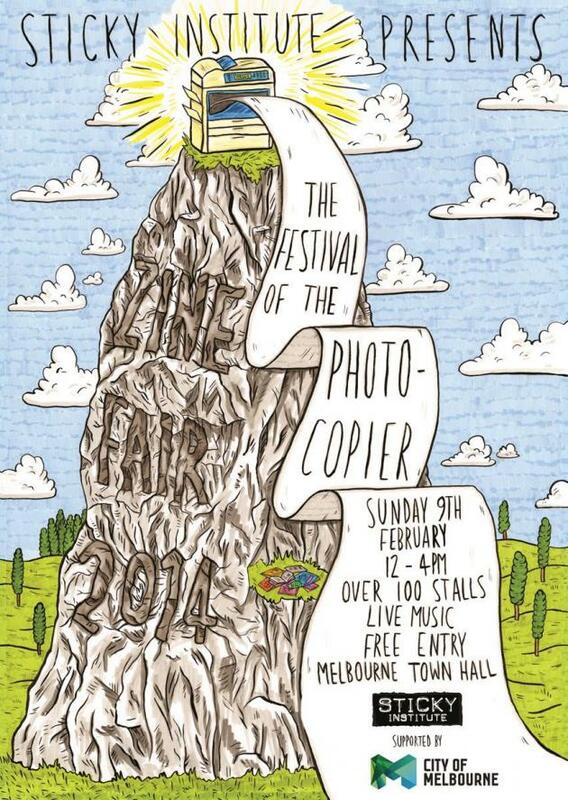 This weekend just gone I worked at the 2014 Festival of the Photocopier at the Town Hall in Melbourne. 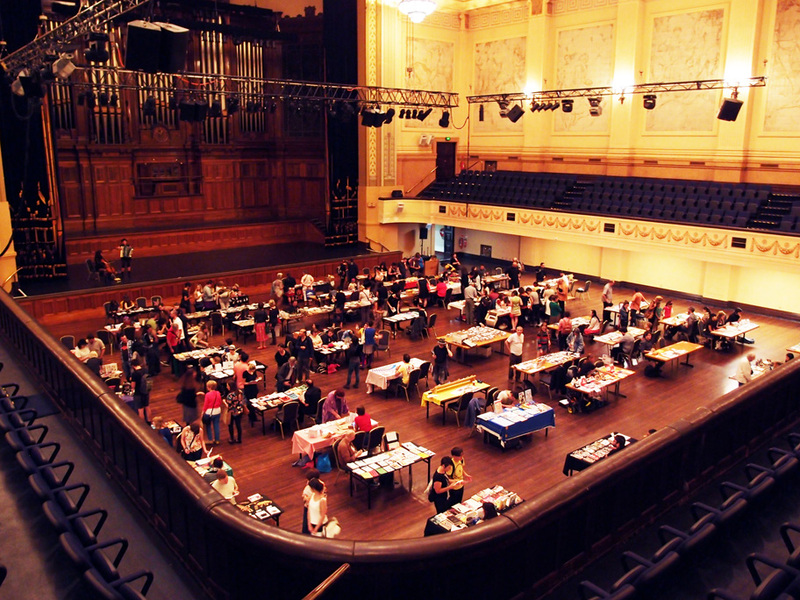 It is always fun to share the same room as around a hundred other artists into making artists books and zines. While there I was also filmed for an interview to do with my practice, zine culture and the role of Sticky Institute. I am not a hundred percent sure what will come of the interview…but if I find out I will link to it at a later date. I have also spent most days in the studio over the christmas holiday period and I have about thirty or so new works from the last two months. 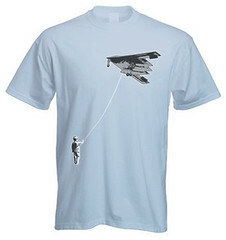 Similar in style to the last show…but getting a little grungier and a bit more industrial. 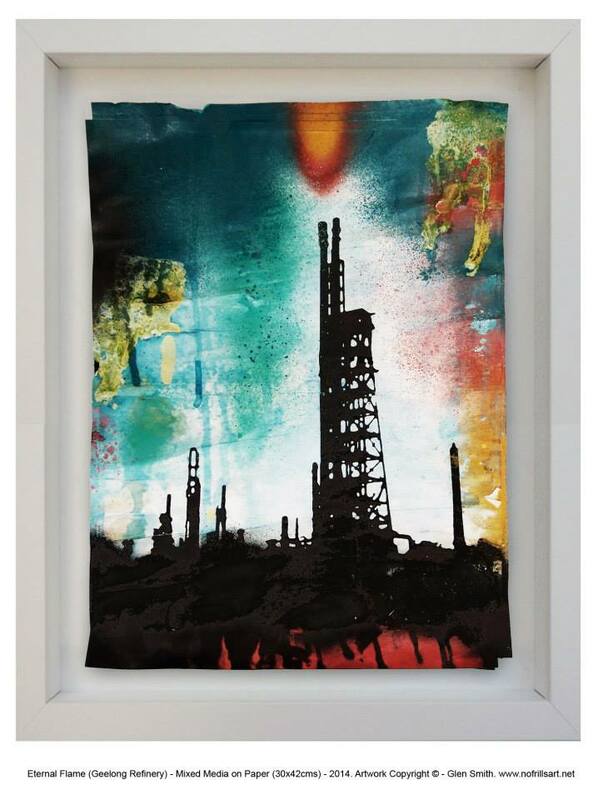 And the final bits of news are that I have started up a Facebook Artists Page which I hope to update often with new works as I head towards another solo exhibition in August this year at Boom Gallery (This time in the big new second space that opened just after my last exhibition). 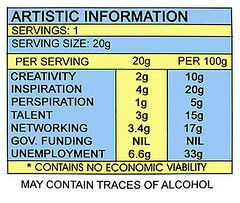 The FB page can be found by searching Glen Smith – Artist on a Facebook search or at www.facebook.com/nofrillsart . It has quickly grown to over two hundred likes in the first two weeks and is climbing strongly which is exciting at both the thought of being able to connect to a new audience, but also in terms of being able to filter my work to select the best works for the upcoming exhibition. Oh…And in other news, just to keep me on my toes I have been doing a bunch of Graphic Design on the side as well as starting to plan for a project in the works out in Inverleigh…but more on that closer to time. 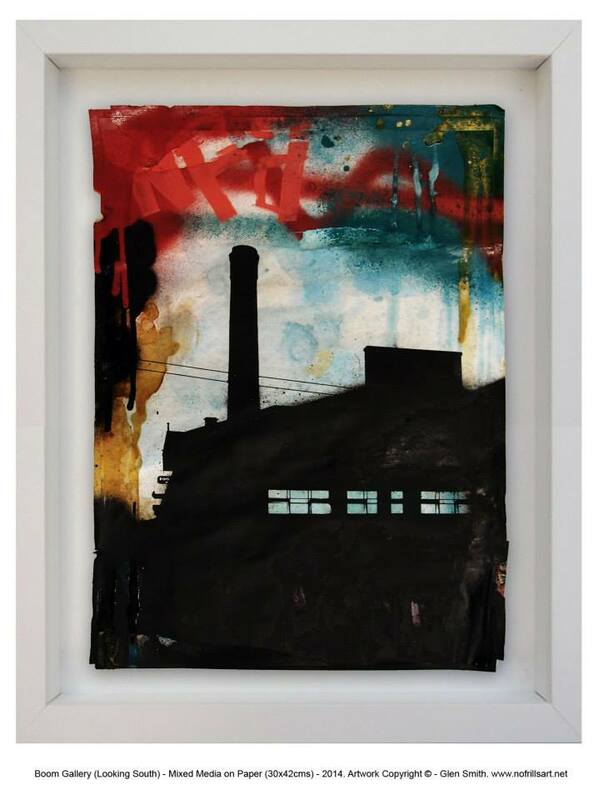 I also have three new publications out, ‘Art Club’ , ‘Sporadic #3 (With David Dellafiora)’ and ‘Life finds a way’, but I will do a feature on the new publications next time. Well I think that is about it for now…stay tuned…And I hope you all have a happy and safe 2014! 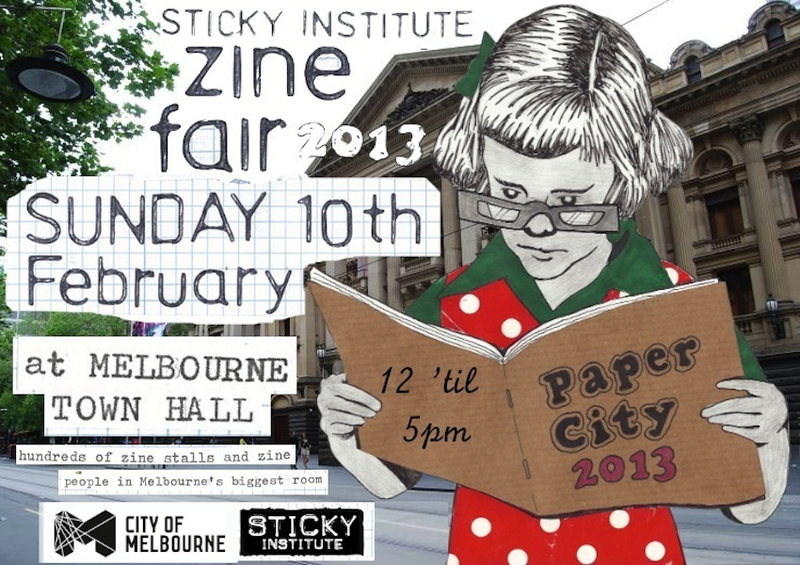 This weekend I worked at Paper City zine fair at the town hall in Melbourne presented by Sticky Institute. 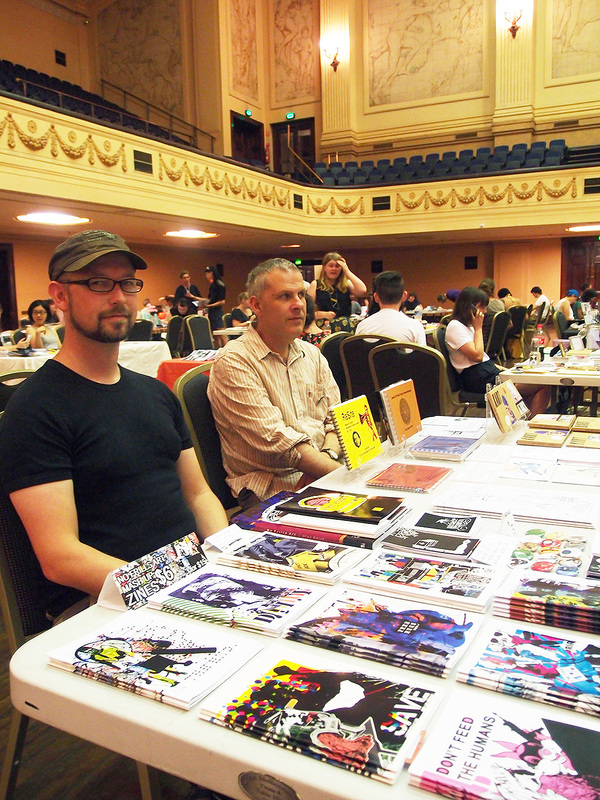 The day saw over 100 tables all selling zines and small press books. It is kind of interesting to see so many people interested in such an alternate practice in one place at the one time. 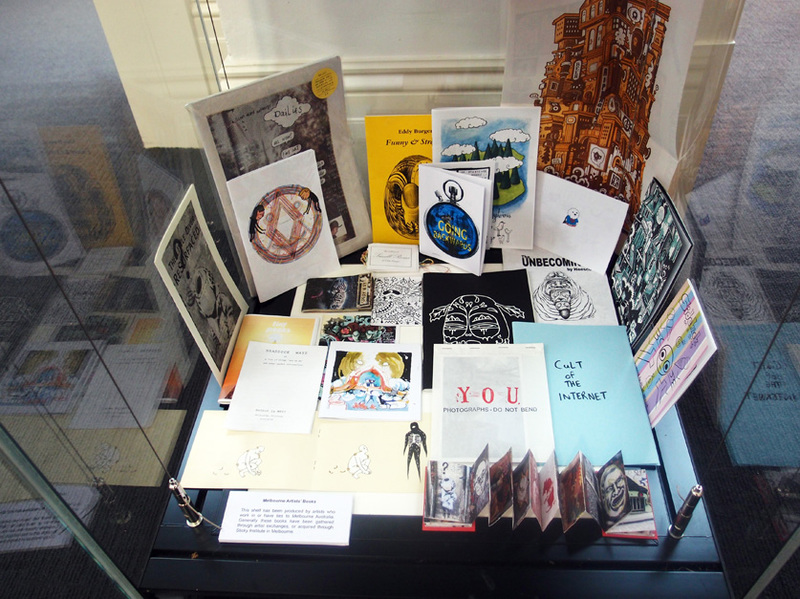 It was really cool to catch up with the regulars, see new audiences developing and starting their journey with zines. 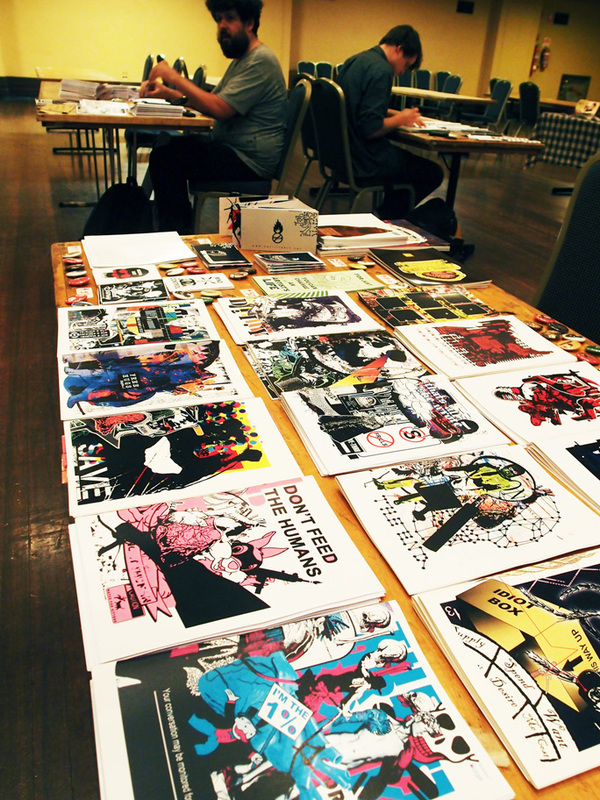 It is also always fun to sell and swap a few publications with the public and other stall holders. Below are a few pix from the day. The first one is of the whole set up from the balcony looking down. While this one is of my table including my new book ‘ Your conversation may be monitored for quality control‘ in the foreground. In other news I undertook a workshop cutting stencils for a local community center a week or two back. It was a fun day with the kids all being good to work with…and demonstrating some promising skills towards becoming the next generation of artists. However, It was the first time my participants had all been under about 12 or 13…eek! This meant that I had to do all the cutting of the designs due to the liability side of things, so for me it was like a small scale stencil sweatshop! However, the kids all enjoyed it, and I think they always seem to enjoy the spray painting part of it the most anyway. 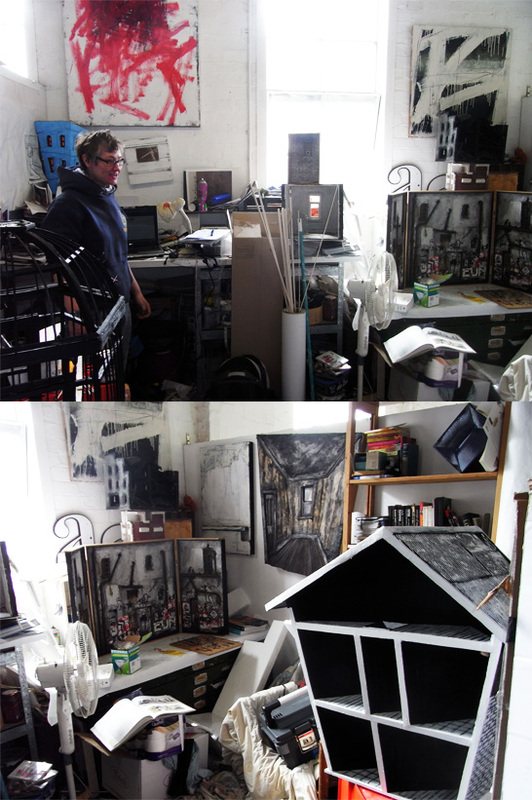 I am still settling into my studio. I have been wanting to take a bit of a break from making art after the solo exhibition at the end of last year, so i have applied myself to doing less creative and more manual constructive tasks of late. 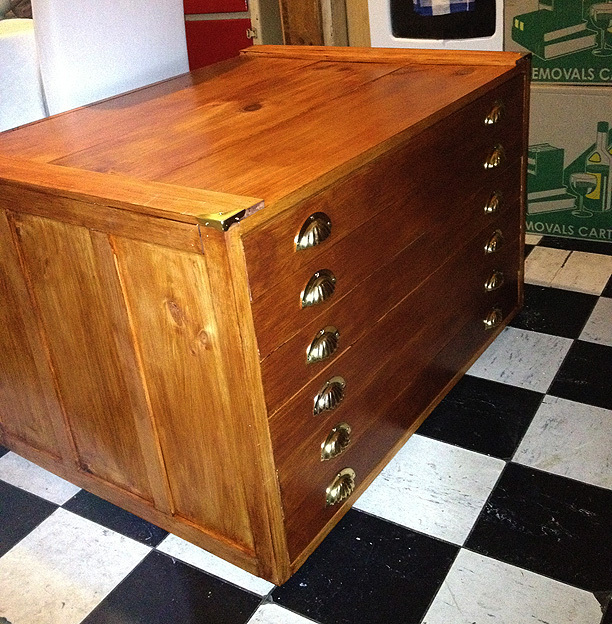 I have always wanted an old wooded plan file, however i could never justify the expense…so I decided to build one. Not exactly is building things out of wood my strong point…but i am pretty happy with the end result. 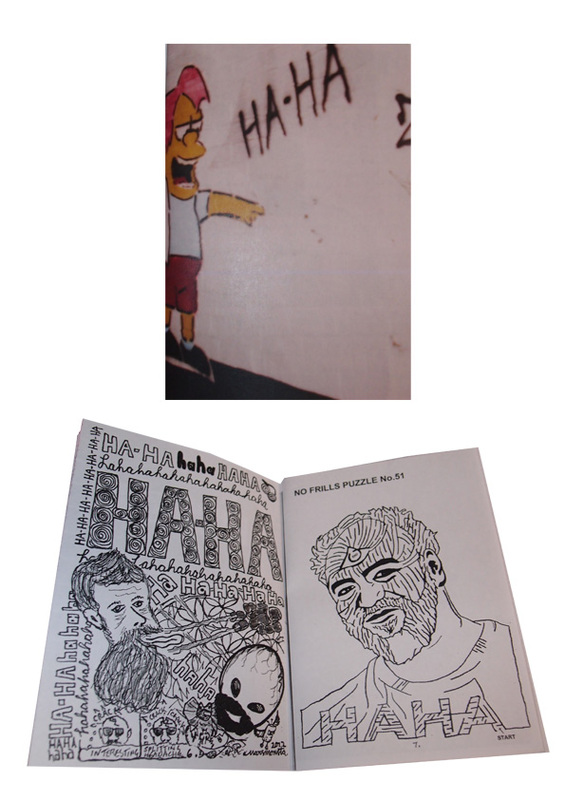 And finally, I just received a copy of ‘Who is Ha Ha’ small press zine produced by Michael Fikaris of silent army in Melbourne. This is a compilation book that i was invited to take part in focusing on NZ/Aust. Artist Regan Tamanui. Below are a few pics of the book and my page on the right. I think that is about it for now. Take it easy! 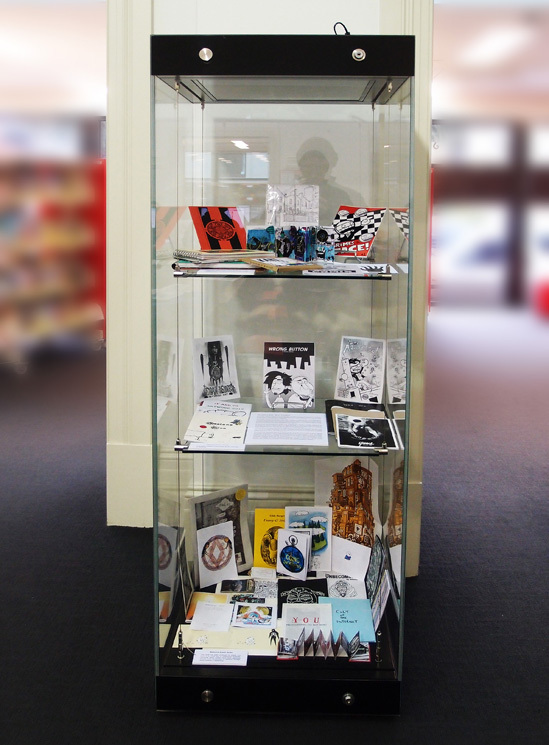 Recently I put together an artists book/zine/small press exhibition in the cabinet at the West Geelong Library. 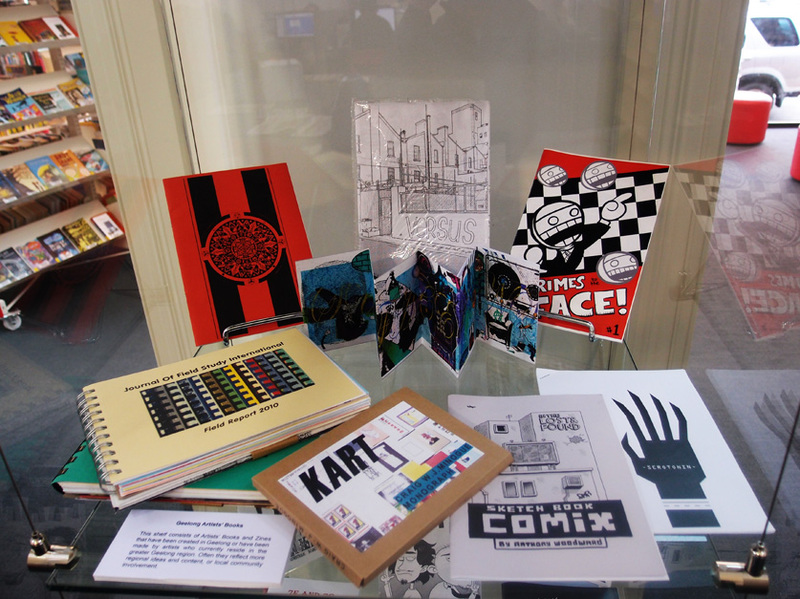 The exhibit focuses on books made by artists in Victoria, and even more so within Geelong. 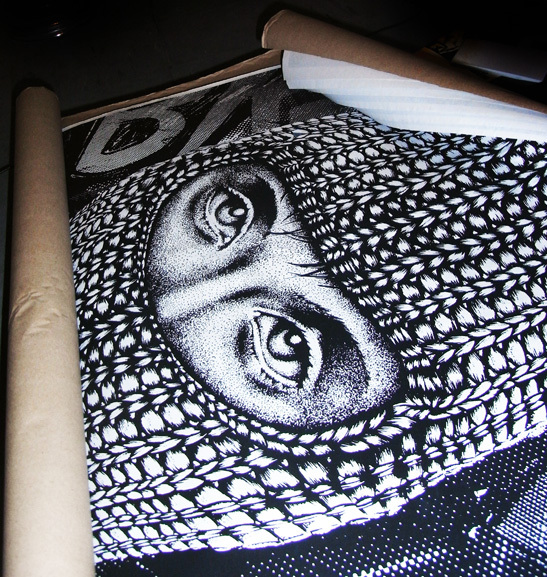 All items have been drawn from the No Frills Art archive. It is a fairly eclectic collection…but well worth a look. So if you’re in the neighbourhood pop in! 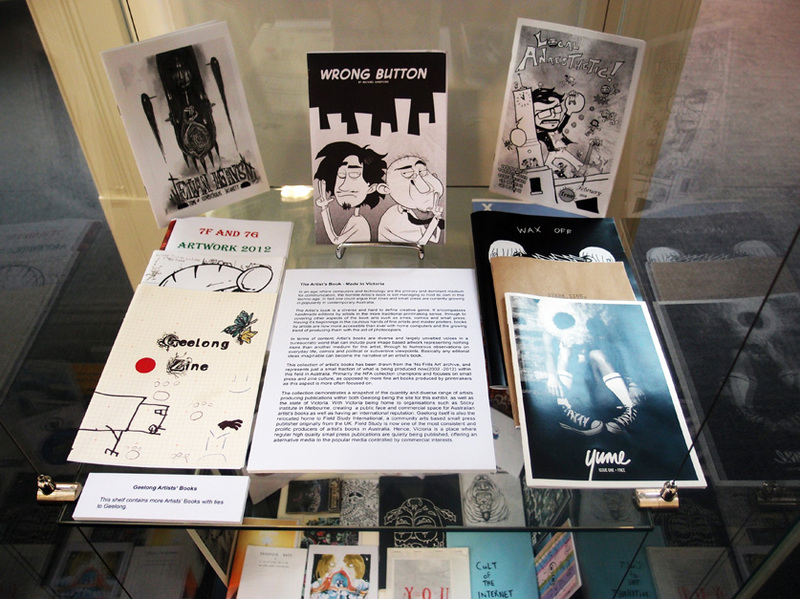 This weekend was the “I am Typewriter” festival and zine fair. The fair presented by Sticky Institute was in the degraves street underground and saw a large number of both stall holders(Over 40 tables!) and audience. 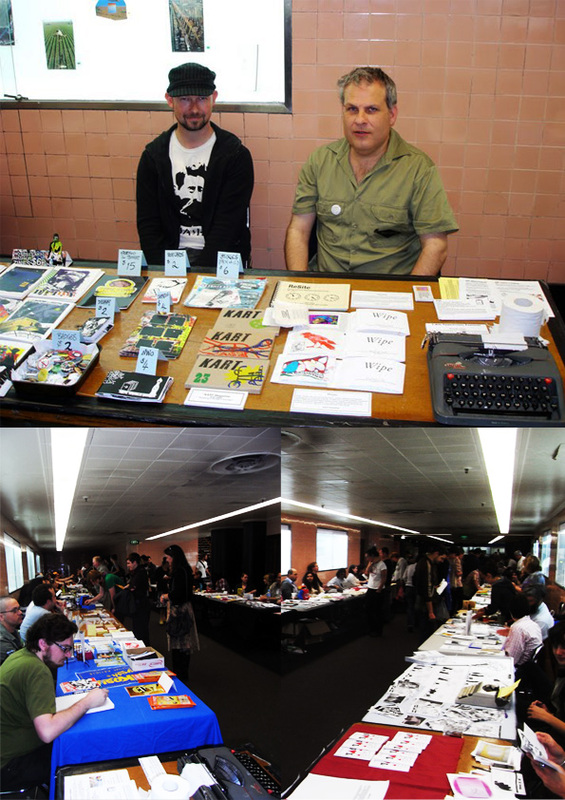 I shared a table with David of Field Study, and combined we moved a descent amount of alternative and small press publications. The day saw the first outing for my new sticker packs, Sample/New World Order/Dismay zines and a bunch of new badge designs. The audience were great, i met a bunch of great new crew and overall the day was a huge success.